Perhaps you've already purchased another learning-Spanish program or two. Or maybe you've purchased several and still feel you’re unable to speak Spanish with complete confidence. Or maybe you’re an absolute beginner. In any case, you may be thinking that you’ll have to spend hundreds or even thousands of dollars on learning Spanish programs and/or private Spanish classes to take your Spanish to the next level. Fortunately, there's no need to spend a ton of money and move at a snail's pace in order to learn to speak Spanish with complete confidence. 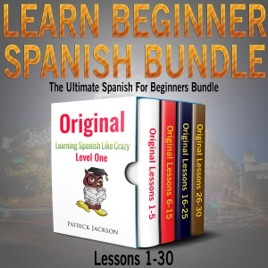 Learning Spanish like Crazy will empower you to step on the gas and peel rubber, taking you from beginner level - or even absolute beginner level - all the way to a level where you speak real Latin American conversational Spanish - and with complete confidence. To learn how to speak Spanish with complete confidence, this is what you need to do now. Download to get started today!